Welcome to another installment of If My Book, the Monkeybicycle feature in which authors shed light on their recently released books by comparing them to weird things. 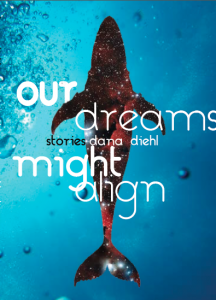 This week Dana Diehl writes about Our Dreams Might Align, her debut story collection just published by Jellyfish Highway Press. If Our Dreams Might Align were a Clickbait title, it would be You’ll Never Guess What Animal This Man’s Wife Brought Home. If Our Dreams Might Align were a roadside attraction, it would be the second largest statue of a Jackelope (Roadside America rates it “worth a detour!”). You stop in Douglas, Wyoming on your way to Mount Rushmore, and you expect the Jackelope to be roped off or to have an entrance fee, but it is alone in an empty park on a corner overlooking a bank. You have your friend take a photo with your phone as you lean against the Jackelope’s concrete haunches and try to find a pose that makes you look overjoyed. If Our Dreams Might Align were a Wikipedia page, it would be written in fragments and have questionable citations. It would contain three lies. If Our Dreams Might Align were a plant, it would be a poinsettia. In December it appears in the check-out lines of Home Depots. You didn’t plan on getting one—you just came here for the hard-to-kill succulent arrangements—but you find yourself placing one in your cart anyway, because it fills you with a sense of nostalgia. You think you remember your mother buying poinsettias every year when you were a child, handing them out to your teachers the day before Christmas break. Just before the cashier rings you up, you remember poinsettias are poisonous to cats, and you have three cats, but you get it anyway. If Our Dreams Might Align were a dog, it would excel in your Basic Obedience class, but then slip out of its collar and jump into the town lake the first time you take it out in public. If Our Dreams Might Align were an antique store relic, it would be a chair with legs made out of taxidermied caribou hooves on sale for $75, open to negotiation. Except the hooves didn’t actually come from a caribou, they came from a deer. A deer that the antique store owner shot himself from his kitchen window. If Our Dreams Might Align were a honeymoon vacation, it would be a camping trip in the Alaskan wilderness. You plan the trip before you plan your wedding, imagining a week of snuggling with your honey in sleeping bags zipped together under a shimmering aurora borealis, the smell of campfire smoke in your hair. The honeymoon comes, and it’s beautiful. But there’s that night the hamburger meat won’t cook, and you don’t eat until midnight. And the night you can’t sleep because you have to pee and you’re afraid a bear is outside your tent. And even though he claims to be an Eagle Scout, your honey can never get the fire going. If Our Dreams Might Align were a tabletop game, it would have different rules every time you played. You’d lose all of your friends trying to win. 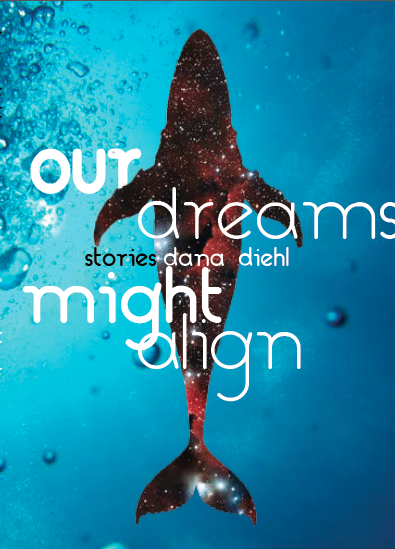 Dana Diehl is the author of Our Dreams Might Align, released from Jellyfish Highway Press in December 2016. She earned her MFA in Fiction from Arizona State University, where she served as editor of Hayden’s Ferry Review. Her work has appeared in Passages North, Booth, North American Review, and elsewhere. You can find more of Dana’s work on her website at http://www.danadiehl.com.